Saiku was founded in 2008 by Tom Barber and Paul Stoellberger. Originally called the Pentaho Analysis Tool, if started life as a basic GWT based wrapper around the OLAP4J library. Over the years it has evolved, and after a complete rewrite in 2010, it was reborn as Saiku. Saiku offers a user friendly, web based analytics solution that lets users, quickly and easily analyse corporate data and create and share reports. The solution connects to a range of OLAP Servers including Mondrian, Microsoft Analysis Services, SAP BW and Oracle Hyperion and can be deployed rapidly and cost effectively to allow users to explore data in real time. By harnessing the power of OLAP, Saiku allows users to choose the measures and dimensions they need to analyse and “slice and dice” the data and drill into the detail to uncover relationships, opportunities and issues. 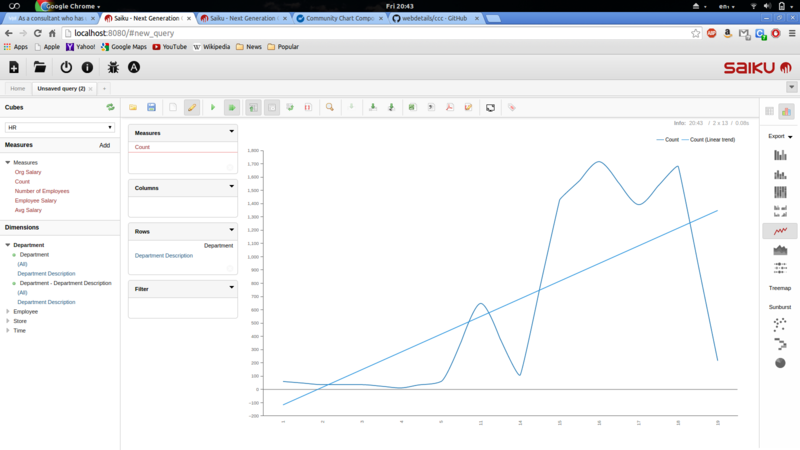 The intuitive user interface lets users drill down and up, filter, pivot, sort, and chart against OLAP and In-Memory engines. Utilizing the Olap4J library, Saiku is the first application on the market to offer support for Mondrian’s Scenario feature allowing non destructive editing of query results, giving users the ability to adjust the figures and perform “what-if” analysis over their data. By harnessing the power of Mondrian, Saiku offers scalable in-memory analysis. Large amounts of data can be stored in memory in a distributed manner across the local network, offering greatly improved performance over large data warehouses as the aggregated data is retrieved from the network instead of reading from disk. Saiku is a modular analysis suite offering lightweight OLAP which remains easily embeddable, extendable and configurable. The Saiku RESTful server connects to existing OLAP systems, which powers user-friendly, intuitive analytics via our lightweight JQuery based frontend. To make sure Saiku survives and sticks to its open source roots, Analytical Labs was created as a business to front Saiku and offer consultancy and development around the Saiku infrastructure. Analytical Labs is based in London. Saiku is freely available to download from [www.saikuanalytics.com](http://www.analytical-labs.com). Organisations can use the solution internally without having to pay license fees. For customers who would like to use the solution in an Enterprise environment a number of options are available for support and to embed the solution into commercial applications. If you prefer more “real time” help and support. We have a very active and helpful community on the Saiku IRC channel. This can be found at ##saiku on the Freenode IRC network. Feel free to drop in and introduce yourself we’ll be more than willing to answer any questions or queries you may have. For customers who require Enterprise Support we offer a complete technical support solution. Support is available on an annual subscription basis. Support is provided via a dedicated support portal where customers can raise issues and support requests, track issue progress and receive responses from our full time support team. Saiku Analytics is licenced under the Apache Licence. Prior to version 2.4 the Saiku server component was licensed under the GPL v2 license and the UI under the LGPL license. From version 2.4 onwards we have switched the entire stack to the Apache license V2. We believe that using a more permissive license will help Saiku grow as a product as it allows people to use the software more freely. © Copyright 2016, Meteorite BI. Created using Sphinx 1.7.9.